Today, I rode my bicycle to Olivet College, my alma mater. As I rode through the small campus, I noticed a great amount activity. The students were returning to school. There were parents leaving their students and helping them get organized. As I was observing all this, the thought popped into my head: “This was what I was doing forty years ago!” Soon, the memories started to flow through my mind as I rode the twelve miles back to Charlotte, Michigan. During my senior year at Highland Park High School, I was trying to decide where I should go to college. I had taken several courses at Highland Park Community College; so I would begin my college experience as a sophomore. After looking at various schools, I chose Olivet College because I really liked its small campus and small town atmosphere. 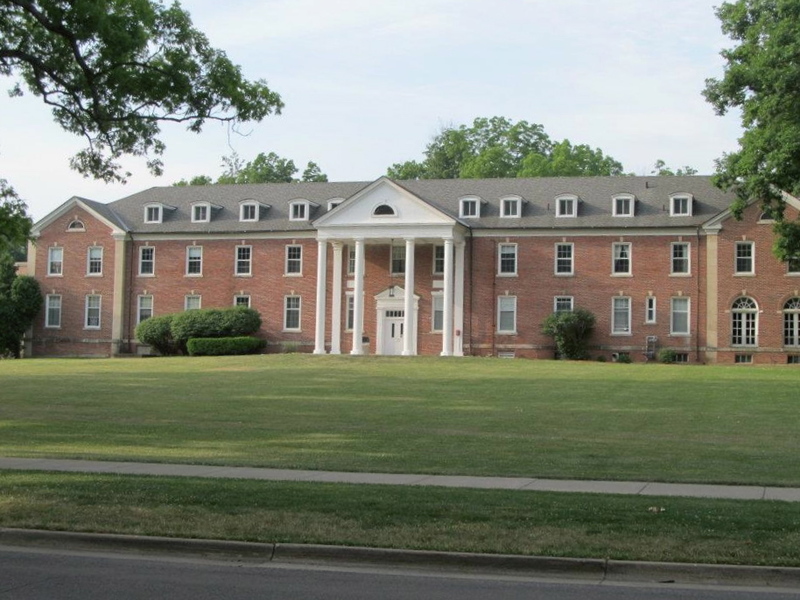 Also, Olivet College was affiliated with the church that I attended which was the Highland Park Congregational Church. Leaving home would not be easy. I had only been away from family and home for a few days during eighth grade camp at Camp Rankin. I would miss my Mom’s cooking and all the other things that she did to spoil me, including making my bed, and taking care of all of my clothes. Also, I would be leaving all that I had known for the first eighteen years of my life, including friends, the many bike rides through the Detroit Metro area, playing tennis at Ford Park and many other activities. My life would be changed forever. 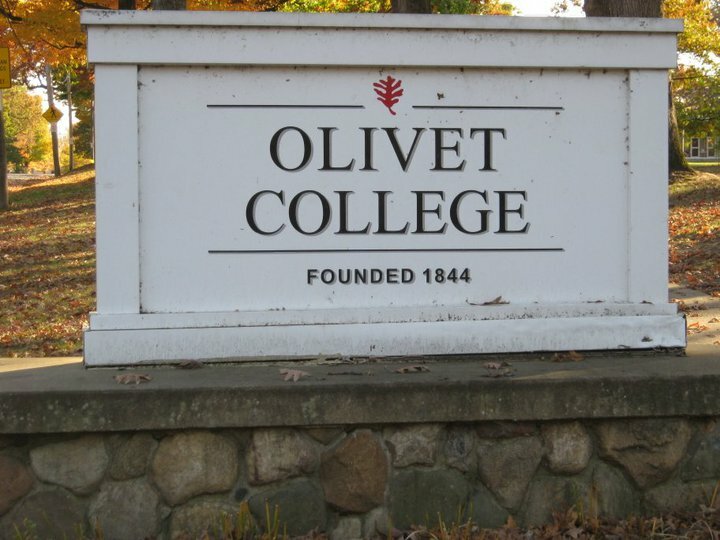 The day finally came when Dad would take me on the two-hour trip to Olivet College. We arrived on campus and soon found our way to the third floor of Blair Hall. As I walked into my room, I was surprised by its smallness and great simplicity. The walls were yellow. There was a single bed, a desk and chair, a dresser and a small closet. The heat would come out of an old radiator by the window. This would be home. I had a single room which was nice, but it also made life a bit lonely. Dad looked at my room and didn’t say much, but I could tell he wasn’t real pleased. Dad being in his late sixties was a real trooper in helping me bring up all my belongings to the third floor. After we were almost done, my Dad went to the restroom. Upon his return, he seemed quite upset. He told me in an angry tone: “The stalls don’t have any doors on them!.” This fact caused him to lodge a protest with the dorm supervisor, but nothing ever changed during the time that I was at Olivet. When Dad left, I was there alone in my small room. I didn’t know a soul at the school. This would be a challenge for me because I wasn’t the most outgoing person in the world. The school provided us with orientation activities where we would learn about the school, spend an evening with a community family, and play games to help us to get acquainted with one another. My group leader was “Big John”. He had come to school as a football player, but an injury would sideline him. I didn’t know then, but “Big John” would have a great influence upon my life, even to the point that the following year, he would take me to the very church of which I am now the pastor. I would soon face many adjustments. One adjustment would be the food. Breakfast was okay because I was quite happy with breakfast cereal and juice. Lunch and dinner were quite challenging. I had to eat food that my mom would never serve us. The food was so bad that the following year, the college had to hire a new food service. Another great adjustment was my clothes. I would soon learn how to wash my own clothes. I must have walked around with wrinkled clothes because I don’t remember ever doing any ironing. Of course, dorm life was quite different. I soon noticed an unfamiliar smell from a room a couple of doors down. It smelled like burnt rubber. I must have been a bit a slow about this because I had never taken drugs, but I soon came to realize that my neighbors were smoking pot. Another adjustment would be the noise level. I still remember somebody practicing with his electric guitar on full volume almost every day. The main problem was that he played the same notes over and over again. I can still remember the notes that he played each day. There were stereos blasting away into the night. Sleep sometimes was difficult to find. When the school year finally started, I soon made some friends. I also became involved with a group called Inter-Varsity Christian Fellowship. We would meet every Tuesday night. We would sing, share and hear a Bible message. Everything was vague to me. I didn’t really understand what it meant to be a Christian at the time; however, it was a great place to meet other students. As I started my classes, I found myself in a class called Intellectual Traditions. 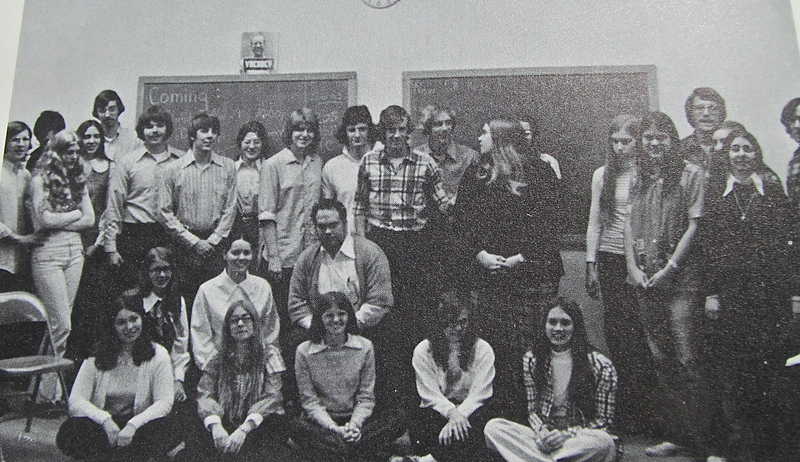 This class was a six-hour class that would cover four semesters. The goal of this class was to study the “Great Books of the Western World”. My teacher for this class was William Buchanan. He looked the part of a teacher for this class. 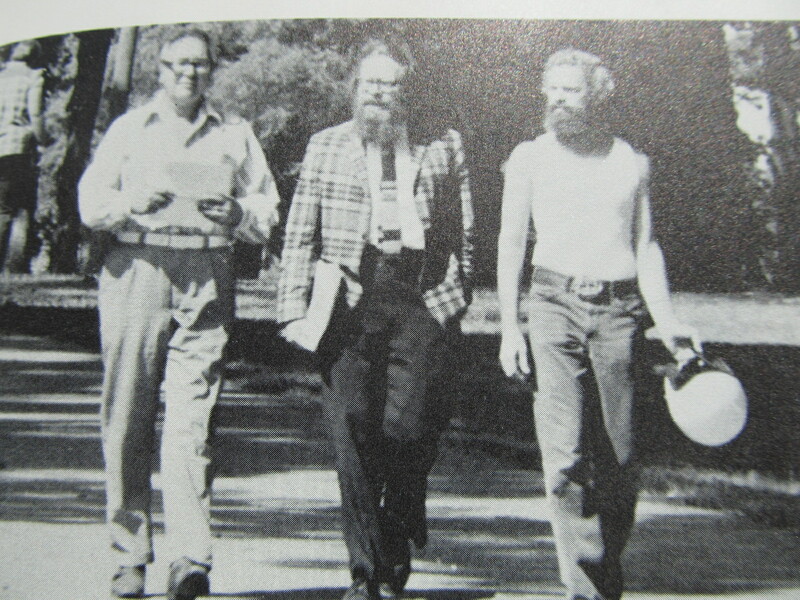 His longish beard and thick glasses hid the quick mind that he possessed. Mr. Buchanan would guide us in discussions of the “Great Books of the Western World.” The reading for the course was immense. One Christmas break, he made us read War and Peace. Mr. Buchanan had a great knack of helping his students to think deeply about what they were reading. His questions for our class discussions were sometimes vague, but they were always challenging. He would have some classes at his house and he even invited us to his cottage on Lake Michigan for a weekend. Mr. Buchanan would help me to learn to think for myself though I am sure there were times he disagreed with me. Mr. Buchanan is the teacher in the center. When my Dad left me that day forty years ago, I realized that my growing up days in Highland Park were nearly finished. Yes, I would return home for a couple of summers, but life would never be the same. Highland Park was now in my past. My future was ahead of me. My two years at Olivet College would be life-changing in many ways. P.S. Please visit my other blog: http://www.markjemilbooth.com. This is where I share my views about spiritual matters and contemporary issues from a spiritual perspective. This entry was posted in Highland Park Memories, School Memories and tagged Great Books of the Western World, Highland Park, Highland Park High School, Intellectual Traditions, Inter-Varisty Christian Fellowship, Olivet, Olivet College, William Buchanan by markjemilbooth. Bookmark the permalink. I guess I don’t remember the popcorn shop. BTW, did you have a brother named Joey? If so, he may be in one of the pictures that I posted with my article on Little League Football. Yes, Joe was younger than me, about your age and did play football. I do remember your brother. I did check and he is in the photos that I posted with my article on Little League Football.